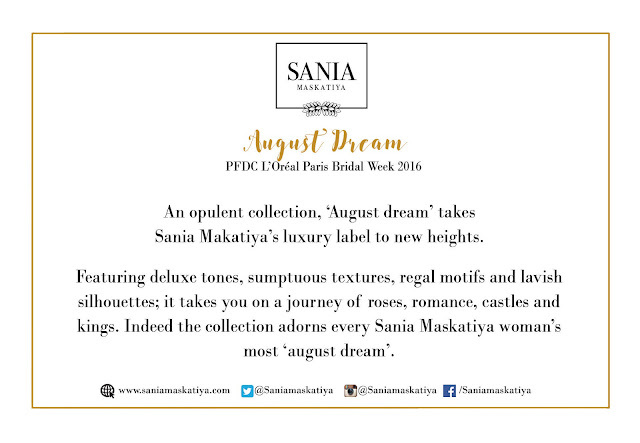 Press Release: Sania Maskatiya to showcase 'August Dream' at PFDC L'Oréal Paris Bridal Week16...! Transforming the traditional and conventional to contemporary, harmonizing the beauty of cuts with embellishment and skilled craftsmanship, The coveted House of Sania Maskatiya announces the showcase of their fall/winter bridal and trousseau collection not only catering to women but as well as men, ‘August Dream’ on Day 1 of the 6th PFDC L'Oréal Paris Bridal Week. Indeed, this is the first time Sania Maskatiya is showcasing menswear at the platform. For this showcase, Sania Maskatiya also announces their collaboration with renowned jeweler Solitaire Designer Jewellery as the official jewellery partner and an exclusive music-mix by City FM 89. ‘August Dream’ draws inspiration from traditional design and techniques for a modern day contemporary bride, envisioning ethereal elegance and sophistication. ‘August Dream’ endeavours to stay true to the brands ethos thus translating through harmony of cuts with embellishment, transforming the conventional to contemporary silhouettes with techniques used on maal, aari, gota tissue and resham; amalgamating in old school silhouettes through muted colours echoing elegance hues of pinks, gold and hints of colour. 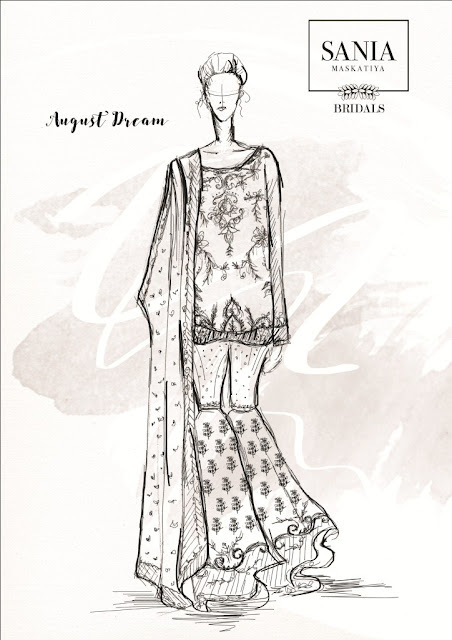 ‘August Dream’ takes SANIA MASKATIYA’S luxury label to new heights. Featuring deluxe tones, sumptuous textures, regal motifs and lavish silhouettes; it takes you on a journey of roses, romance, castles and kings. Indeed the collection adorns every SANIA MASKATIYA woman’s most august dream. 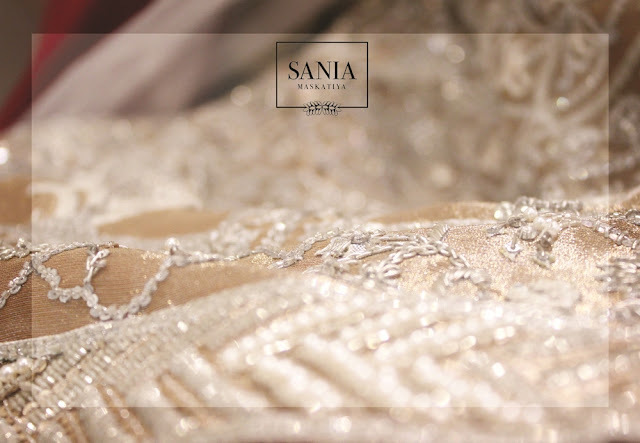 ‘August Dream’ will be available for custom order at the Sania Maskatiya bridal studio Lahore, immediately following its runway debut Thursday 29th September 2016; in Karachi at Sania Maskatiya Flagship Store on Friday 30th September 2016; Dubai on Thursday 13th October and in Islamabad on Wednesday 19th October 2016. “Our experience at the platform is always delightful and we look forward to showcasing an ‘August Dream’ this year. The collection draws inspiration from traditional design and techniques for a modern day contemporary bride, envisioning ethereal elegance and sophistication staying true to the brands ethos through harmony of cuts with embellishments.” said Sania Maskatiya. The Sania Maskatiya brand is best known for their versatile, specialised prints, textile design based on pure fabrics, unique colours, and fine craftsmanship. The brand has rapidly expanded both nationally and internationally. 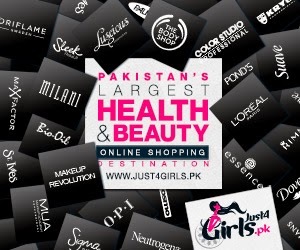 In Pakistan the brand hosts three stand-alone stores each with one more store in the works of which is located in prime shopping locations both in Karachi and Lahore. The brand is further available at select national stockists. Internationally, the brand continues to develop regional and global presence; to that end Sania Maskatiya has been shortlisted for the coveted International Woolmark Prize for the second consecutive time this 2015 with two nominations at Lux Style Awards 2015 for the Best in Fashion Design Prét and Bridal categories and is one of the first brands from Pakistan to have staged a solo showcase at the Lakme Fashion Week in 2014. In terms of retail and global accessibility, the brand is further available worldwide through a dedicated e-commerce store, in the Middle East through a stand-alone retail space in Dubai and in Europe, the US, Singapore and India through a series of stockists. Review: PAL Unstitched Embroidered Kurti...!!! This PAL Embroidered kurti is lilac and pink in color. 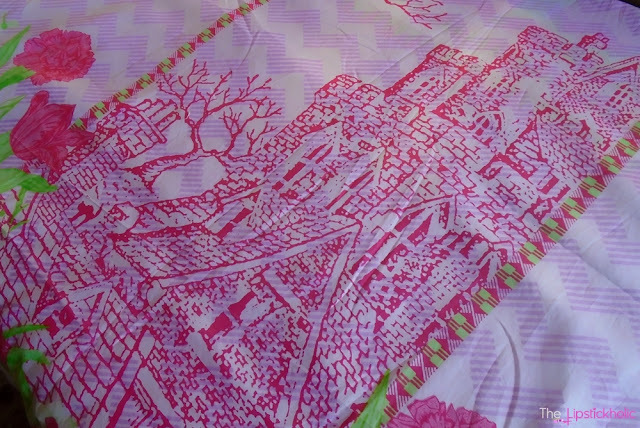 It has embroidery on front, below neck and pretty castle and floral print at the daman of the shirt. Embroidery is very fine and neat. I really love the trendy design of this kurti. The quality of the fabric is not as good as their lawn suit but its still good for the price and is perfect for summers. The beautiful design and color scheme of this kurti has surely won me over. 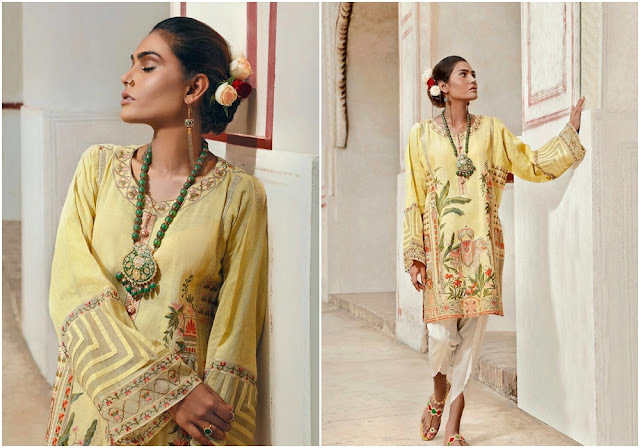 If you are planning to stock up some good quality, reasonably priced unstitched kurtis and lawn suits for next season, then now is the right time to shop as Din Lifestyle is offering huge discounts on its lawn collection. Price & Availability: PAL lawn kurtis are available at leading stores nationwide. Also available online at Din Lifestyle Website for Rs 1350/- each. Do check out the complete range of PAL and Silveen summer and winter collections at Din Lifestyle Website. Press Release: L’Oréal Paris Excellence Crème partners with Hassan Sheheryar Yasin for the ‘Excellence Reds’ Collection...!!! 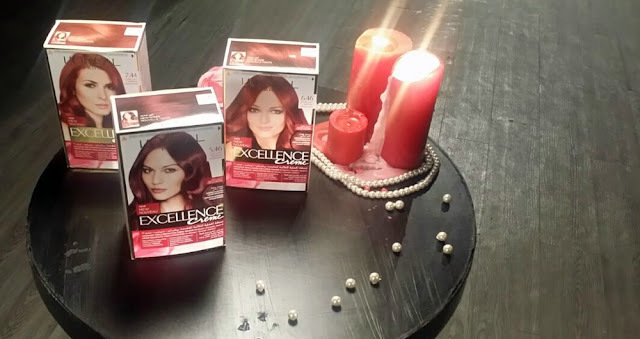 The world’s leading beauty brand, L’Oréal Paris Excellence Crème introduces a bold and radiant hair color collection, the “Excellence Reds”. 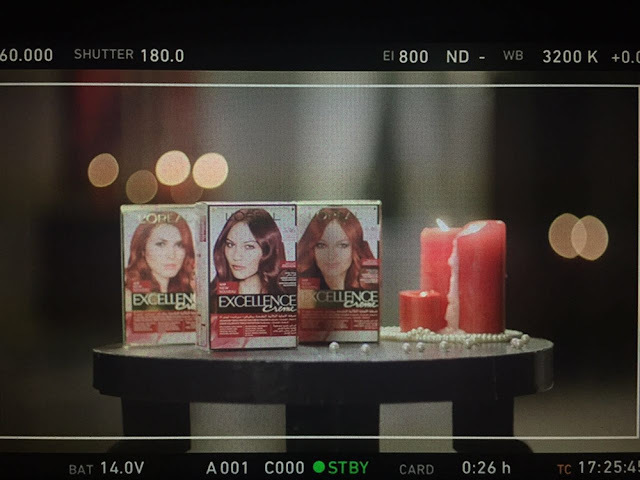 This campaign brings to life the beauty and powerful personality of red hair. Excellence Crème has collaborated with Pakistan’s King of Couture Hassan Sheheryar Yasin under the prestigious ‘Ambassador of Fashion platform’ which aims to consistently innovate by launching all-encompassing beauty and fashion trends. L’Oréal Paris Excellence Crème’s Reds Collection comes in three iconic shades, which have been developed with an exclusive mix of pigments and provide the signature Excellence Crème triple protection. The collection comes in three distinct shades: 5.46 (Grape Red), 6.46 (Ruby Red) and 7.44 (Pepper Red). For the Excellence Reds campaign, HSY has played with a selective color palette using dark colors to provide contrast and accentuate the red fiery hair. The Excellence Red woman signifies strength, independence and ability to get around in the world with the perfect hair. Hair that sets her apart from the rest of the world by providing a statement and gives her the confidence she needs to make her dreams come true. The campaign will feature L’Oréal Paris Pakistan spokesperson Mehreen Syed and award-winning model Hasnain Lehri with campaign photography by Fayyaz Ahmed, videography by Hamad Khan and hair and makeup by N-Pro. Rated the world’s no. 1 hair color, Excellence Crème uses an advance triple protection technology with three active protective ingredients for smooth, silky, and replenished hair. 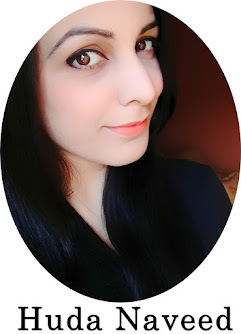 The product will available for PKR 1,169 at all leading retailers nationwide from X September 2016.
Review: MAYA Cosmetics Water/Oxygen Permeable Nail Lacquers...!!! 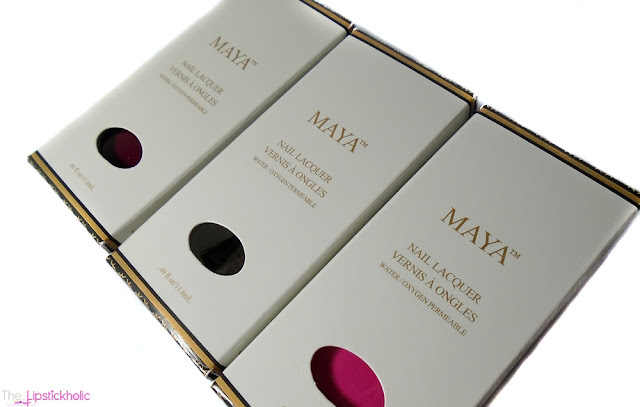 - MAYA Cosmetics nail lacquers have been tested and accredited by various health specialists as being healthier than other standard nail polishes. - Have been verified by PETA as being animal-free and vegan-friendly. - Have been verified as 100% Halal. 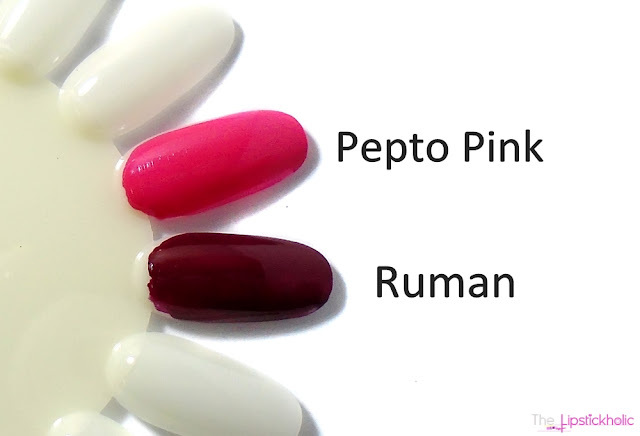 I got two shades of MAYA Nail Lacquers, "Ruman" and "Pepto Pink" along with their "Glossy Top Coat". The nail lacquers are richly pigmented. They have thin and runny consistency. 1-2 coats of the nail lacquers provide perfect, opaque coverage. Top coat provides a really nice shine to the nail color and makes the nail color last longer. The staying power of these nail lacquers surprised me the most. They lasted on my nails for almost one week or more which is really amazing. I noticed slight chipping after about 5 days which is not at all bad. If you have been following me on snapchat "@Lipstickholics", you would have seen my updates on these nail lacquers. Overall, the pigmentation and staying power of these nail lacquers is really good. Now talking about the Water/Oxygen Permeability of these nail lacquers. The directions to do wudu/ablution with these nail lacquers is mentioned on the package. - Apply one layer of MAYA Nail Lacquer and/or a layer of MAYA top coat. - Each time you perform wudu, run nails under water and rub the nails gently for ten seconds. 1- I applied 1 layer of MAYA Cosmetics Nail Lacquers on a tissue paper, one with and one without the top coat. 2- I placed another tissue paper below the tissue paper on which I applied the nail lacquers. This dry tissue paper is shown in water permeability test picture 1. 3- I poured drop of water on the nail lacquers on tissue paper as shown in water permeability test picture 2. At first the drop seemed like floating on the surface. 4- As mentioned on the package and website, I rubbed the drop carefully for 10 seconds on the nail lacquers on tissue paper. 5- The water passed the nail lacquers upon rubbing for 10-12 seconds. 6- I lifted the tissue paper to see the tissue paper below and it was wet showing the water has actually passed through the nail lacquer layer. The dry tissue paper has now wet spots that can be seen in water permeability test picture 3. I repeated this test carefully a couple of times to be sure of the results and each time the water passed through the nail lacquers upon rubbing for 10-12 seconds. The test conducted by MAYA Cosmetics is also clearly shown and demonstrated in a video on MAYA Cosmetics Website and Facebook Page. You can check the video below or here on Facebook. To sum it up, I would say MAYA Cosmetics Nail Lacquers have lived up to my expectation. As per the certifications provided and the tests conducted, they have proven to be water/oxygen permeable which makes them wudu-friendly, if used according to the directions mentioned. These nail lacquers are HALAL Certified and Vegan. The pigmentation and staying power of these nail lacquers is really good too. In my opinion, these nail lacquers surely are worth the price and something every Muslimmah needs. 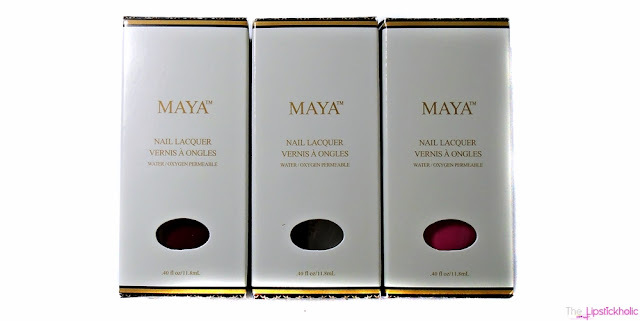 Price & Availability: MAYA Cosmetics Nail Lacquers are available at Maya Cosmetics Website for $13.99 each. 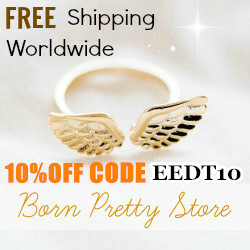 They ship worldwide. Do join MAYA Cosmetics on Facebook for further details and updated. You can contact them on the page for certifications, delivery in Pakistan and other queries. 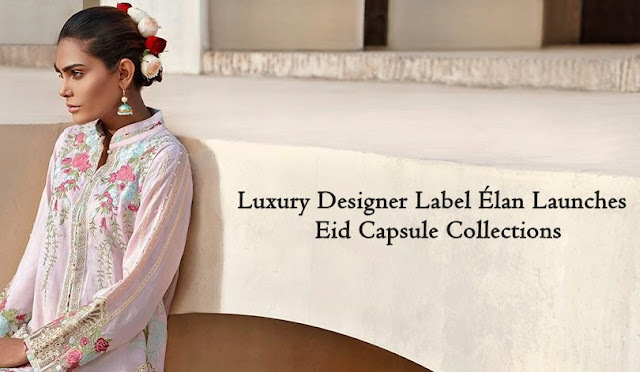 Press Release: Luxury Designer Label Élan Launches Eid Capsule Collections...!!! 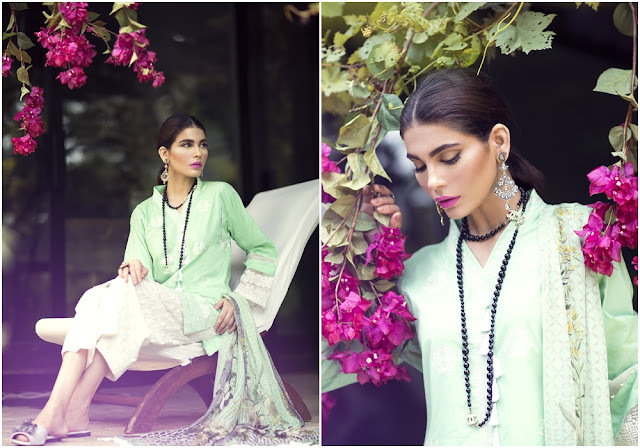 Pakistan’s premier luxury designer label Élan introduces two Eid capsule collections: Le Rêve in Luxury Prét and Ghazal for their Luxe daywear line, Élan Vital, to commemorate Eid-ul-Adha. The new collections are now available at Élan’s Flagship Store at Galleria Mall in Lahore and online on www.elan.pk for international and local customers. Press Release: Sapphire’s Eid Luxe Collection Available Nationwide...!!! Pakistan’s leading high-street and retail brand, Sapphire has launched their coveted Eid Luxe 2016 collection, available in stores nationwide. The collection is an embodiment of elegant soigné ensembles, perfect for the celebratory season. Sapphire's Eid Luxe 2016 collection features rich embroideries on shirts paired with the finest of silk and chiffon duppatas with Sapphire’s signature plush prints. The color palette consists of yellows, black, lilac, blue, beige and mint green. The collection comprises of trendy silhouettes including rising hemlines and breezy wide leg pants, capris and culottes and is available as two piece suits with a price range starting from PKR 8,000 to PKR 12,000. 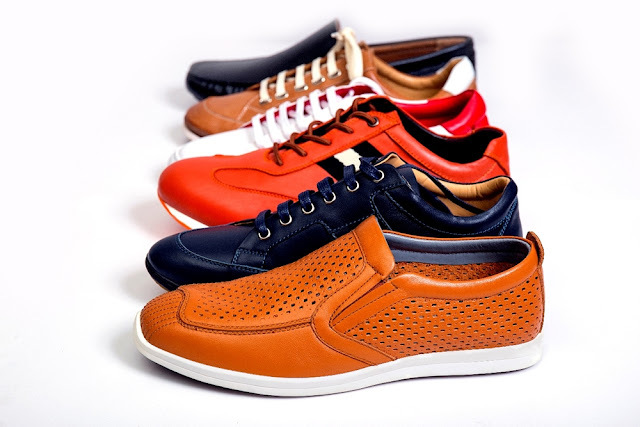 Sapphire’s shoe line is also available nationwide, which includes formal and casual shoes for men such as lace ups, sneakers and loafers as well as sneakers for women with a price range of PKR 5,000 to PKR 8,000.